The 252-page catalog, which is available in a print or digital format, features updated and expanded information on Brady’s line of printers, materials, ribbons and additional products. 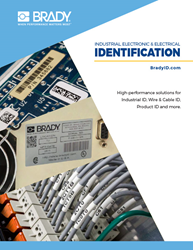 Brady (NYSE:BRC), a global leader in industrial and safety printing systems and solutions, today announced its new Industrial, Electronic and Electrical Identification Catalog. The 252-page catalog, which is available in a print or digital format, features updated and expanded information on Brady’s line of printers, materials, ribbons and additional products. New printers: BMP®21-PLUS portable printer, and BBP®12, BBP®35 and BBP®37 benchtop printers. New materials: B-533 and B-7425 general ID labels, B-717, B-718, B-719 and B-776 circuit board labels, B-362 tamper indicating labels and B-7511 temperature indicating labels. In addition, the thermal transfer (THT) print ribbon pages have been redesigned for better ease-of-use, and additional colored ribbon parts have been added. Dot matrix, laser and ink jet printable materials have been added or updated as needed. With the recent development of Brady Workstation Label Creation Apps, this section has been added to the new catalog, including Brady Workstation Print Partner and Brady Workstation Data Automation software. View the digital version of the new Industrial, Electronic and Electrical Identification Catalog now.